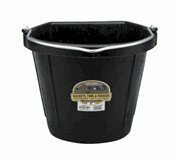 Plastic Pail - 20 Qt. 20 quart, flat back plastic pail with metal handle. 20 qt. flat back heavy duty.